The threat that terrorists pose to US interests and security did not create killing drones: rather the technical feasibility of killing drones has generated imagined terrorist threats. Book review. Assembling a predator drone out of the box in about two hours, 2012. Wikicommons/ Sgt.Ken Scar. Public domain.It is nearly fifteen years since the United States, followed by a few of its closest allies such as the United Kingdom and Israel, used unmanned flying vehicles, better known as drones, for targeted killings. As is often the case with new weapons and new technologies, the implications of these actions have passed unnoticed. In a disturbing silence, occasionally broken by brave investigative journalists and scholars, they are becoming de facto a standard practice of modern warfare. But a few moments of reflection suffice to realise that targeted killings through drones are egregious war crimes. They violate basic human rights and the laws of war that were established several centuries ago. A fresh, well-researched and well-written book by Laurie Calhoun (We Kill Because We Can. From Soldiering to Assassination in the Drone Age, Zed Books, London, 2015, ISBN 978-1-78360-548-4) provides an occasion to think about the deep implications of killing people though drones and hopefully to act to stop this high-tech barbarian practice. The first and rather disturbing thing about drones’ targeted killings is the lack of rights for those included in the “kill-list”. When a human becomes a target – supposedly because he is terrorist, a would-be terrorist or has friends that are terrorists – he does not receive any notification and has no possibility to defend himself from the offences for which he is accused. The offences may be right or may be wrong, but once he has become a target, he is sentenced to death with no appeal. The offences may be right or may be wrong, but once he has become a target, he is sentenced to death with no appeal. How should we consider the target? What is he? An enemy, a soldier, an indictee, a defendant? Nobody tells us and the use of the word “terrorist” is an alibi to avoid responding. If the target is regarded as a soldier, he should be given the typical guarantees that are provided in wars, including the possibility to surrender to the enemy. Soldiers can, of course, be killed in action, but this requires there to be a clearly defined theatre of war and for the targeted soldier to in some ways be able to harm others. None of these conditions applies in the case of a human being killed by a drone. In the majority of cases, they are hit when they are unarmed and when they are far away from combat. If the target is considered a defendant, he should have the right to a fair trial with explicit charges and a proper defence. The accusations should be singled out. Needless to say neither the human beings killed nor their relatives will ever know why and who has killed them. Individuals to be ‘taken out’ will never benefit from any further cross-examination. As Calhoun clearly argues, there is no difference between killings carried out by drones and extra-judiciary executions. And this becomes even more worrying in light of the fact, as it has emerged from information recently uncovered by The Intercept, that according to the Pentagon most of the targets are “individuals exhibiting suspicious behaviour” rather than terrorists beyond any reasonable doubt. According to the Pentagon most of the targets are “individuals exhibiting suspicious behaviour” rather than terrorists beyond any reasonable doubt. The second and surprising thing is who is responsible for making these executions, at least those carried out by the United States. 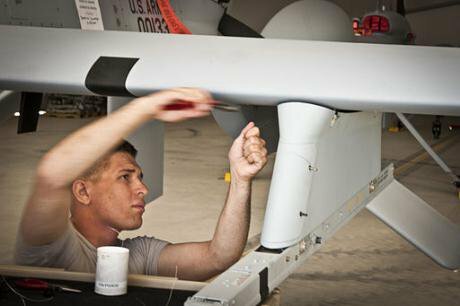 Even if using drones in other countries is an act of war, the Pentagon is not in charge. It is the Central Intelligence Agency who carries out these executions. In principle, we would expect the CIA to collect information for the security of its country and that of its allies. But in this case – and perhaps in many other cases – the CIA does not limit itself to collecting information. Killing through drones has apparently become the most popular method to eliminate (i.e. assassinate) enemies or simple suspects. The US Department of Defence is well aware of the difference between combatants and non-combatants and when and how the former can be attacked. It is true that the Pentagon often ignores the distinction, especially when aerial bombing is used, and it has been responsible for a huge number of civilian causalities. But at least the Department of Defence is familiar with the language and the practice of the law of war. The CIA acts as if there are no legal constraints on its actions. Who takes these decisions? The information recently provided by The Intercepts suggests that it is not the President of the United States, but an anonymous chain of spies on the field and bureaucrats in Washington. Ultimately, the selection of the targets appears to be in the hands of unknown bureaucrats. As it happens with extra judiciary executions, the executors are unaccountable and anonymous. The third and worrying factor is associated to the “collateral damage”. Since strikes by drones are secret, there is not enough information on how many of the individuals killed are the targeted ones and how many of them are their relatives, friends, children or simply pedestrians that were in the wrong place at the wrong moment. The CIA has not released any data on this particular dimension of drone warfare and this is, by itself, a terrible sign: on the one hand, the most sophisticated technologies are effectively used to trace, follow and kill the targets and, on the other hand, the adverse consequences of these actions are simply kept secret. The independent estimates collected by individuals that have no direct access to the official sources estimate that individuals killed by mistake range from 9 to 25 percent, according to the period and to the country. This seems anyhow a very high percentage, a percentage that would be totally unacceptable in the fight against organized crime within countries. In the United Kingdom, the use of drones to kill has generated much wider concern and reprobation than in the United States. David Cameron had to inform the public that British drones killed individuals, and had to explain why he and his government opted for the extra-judiciary killing rather than for other forms. He himself is risking incrimination for war crimes by the British judiciary. But any judicial constraint in the United States or Israel has yet to emerge. What is most disturbing is that a new military technology is going to be used long before the social, political, ethical and legal implications are considered. Warfare is more and more led by the technical possibilities rather than by political aims or by ethical considerations. Warfare is more and more led by the technical possibilities rather than by political aims or by ethical considerations. It seems that once the new technology is available, the targets should be created to experiment with the new toy. If targets are not available they should be fabricated. It is not the threat that terrorists pose to US interests and security that have created the killing drones, but rather the technical feasibility of killing drones that has generated imagined terrorist threats. Also in need of assessment is the impact of this warfare in comparison to the declared political aims of those who use it. Have they actually helped to win the war on terror? Have drones made the United States and their allies safer? Have they saved the lives of Western soldiers that would otherwise be deployed on the ground to fight the same insurgents? I do not feel competent to provide answers to these questions. But not even an enthusiastic positive answer to all these questions would justify a form of warfare that it is clearly illegal. Liberal states should apply their standards even under the most uncomfortable circumstances. And the advantages of assassinating would-be terrorists in Pakistan or in Yemen do not justify the use of illegal methods. The exhibition of technological muscle and the act of power implicit in the fact that one country could assassinate individuals without even exchanging a post-card with them is generating perverted reactions that ultimately damage the war on terror. If even a liberal regime such as the United States regularly carries out extra-judiciary executions, how can we fight ISIS for the same type of crimes? What are the lessons that we are providing to young people in the West and in the Middle East? The only lesson that the United States is currently provided is well explained in the title of Calhoun book: “we kill because we can”. But if this is the lesson, why shouldn’t any desperate teenager with a knife to behave likewise? At the moment, bombings are carried out by the United States, Israel and the United Kingdom. Proud of their new technology, their governments appear satisfied to show to their rivals that they are ahead. But, as usual, this is far from being the definitive scenario. As the long and tragic history of arms race has shown, it is very difficult for a nation to preserve its lead indefinitely. As already indicated by Paul Rogers more than two years ago, the United States will not be the only country to play with the murderous toy. More countries are developing similar technologies, and emerging countries, including Russia, China and India, are now developing their own models. It will not take long before other states and perhaps even non-state actors will have their own flying killing devices. We will soon have a jungle in the sky and the extensive use carried out by the United States will make it more difficult to persuade new entrants to accept a common sense regulation. This form of technological assassination is a shame for Liberal states. It increases the hate of technologically less developed countries against the West and it ultimately will fuel non-regular forms of political violence, including terrorism. There is no proof that this is an effective war strategy or that it is serving precise political aims. It is a way in which a group of non-accountable old boys from CIA enjoy themselves with a cruel weapon rather than with a joystick. It should be stopped before it becomes a standard method to get rid of your enemies. The first thing to do is a direct appeal to the individuals that are using drones. These individuals should be clearly informed that they are committing war crimes for which they may be individually responsible. By using killing drones, they become combatants with all the associated risks and implications. The Principles of Nuremberg, promoted by the United States and other liberal countries nearly seventy years ago clearly stated that “the fact that internal law does not impose a penalty for an act which constitutes a crime under international law does not relieve the person who committed the act from responsibility under international law”. The second is to activate judicial examination of these extrajudicial killings. The Human Rights Council has already included this form of killings in its report on extrajudicial executions. The Special Rapporteur on extrajudicial, summary or arbitrary executions should clearly investigate the case in the United States and elsewhere and report the information collected to the Human Rights Council. The third is to develop some clear guidelines on the prohibition of unmanned vehicles to carry out extrajudicial executions. There is already a model in which like-minded states could progress and this is the Ottawa Treaty Convention fort the Anti-Personnel Mine Ban. Politically, the countries willing to join such a venture might be a few, but it is likely that the number of states will increase if, as expected, the use of unmanned killing drones continues to proliferate. The fourth would be for civil society to take responsibility by organizing an Opinion Tribunal devoted to this form of crime. Bertrand Russell, Jean-Paul Sartre and Lelio Basso started this form of public denunciation for war crimes in Vietnam and the activities have flourished since then with the Permanent People’s Tribunal of the International Basso Foundation in Rome. More recently, an opinion tribunal has reviewed in detail the legality of the war in Iraq and the war crimes committed by occupation troops. A similar venture should now be tried for the use of drones, with a view to obtaining a clear and definitive banning of remote killings in international law. See Cora Currier, The Kill Chain. The Lethal Bureaucracy Behind Obama’s Drone War, “The Intercept”, Article n. 3 of the The Drone Papers, Oct. 15 2015. The drone papers, The Intercepts, Oct. 15 2015. Chris Woods, Drone War Exposed – the complete picture of CIA strikes in Pakistan, “Bureau of Investigative Journalism”. Jimmy Carter, “A Cruel and Unusual Record” New York Times, June 24, 2012. For a collection of critical perspectives, see Jeffrey Bachman, Drones and the Human Right to Peace, special Issue of “Peace Review: A Journal of Social Justice”, vol. 27, no. 4, October-December 2015. Nicholas Watt, Patrick Wintour and Vikram Dodd, David Cameron faces scrutiny over drone strikes against Britons in Syria, The Guardian, Tuesday 8 September 2015. Press Association, David Cameron faces legal challenge over Syria airstrikes. Green party politicians join forces with human rights group to criticise lack of clarity over government’s ‘targeted killing policy’, The Guardian, Thursday 24 September. Paul Rogers, Drone warfare: a global danger, opendemocracy, 26 September 2013. Christof Heyns, Report of the Special Rapporteur on extrajudicial, summary or arbitrary executions, United Nations, Human Rights Council, 24 April 2015. Muge Gursoy Sokmen, Arundhati Roy, Richard Falk (editors), World Tribunal on Iraq: Making the Case Against War, Olive Branch Press, Grand Rapids,Michigan, 2008.